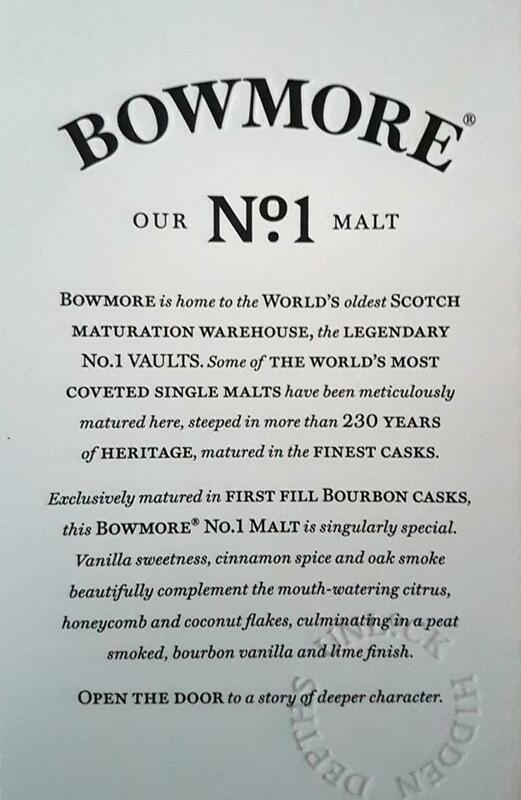 The NAS successor to the Small Batch - a cheap and neat Bowmore! Peat, cardboard, tangerine, malt and salt. The sweetness mainly comes in the finish. This really is a twin of the Small Batch, albeit somewhat cheaper. Around 35 EUR. A nice entry for people who are not yet familiar with Islay whisky. The nose is sweet and fresh on vanilla, apples, grapes, lime (including zest) and lots of sea salt. A classic Bowmore if you ask me. The smoke is in the background, making it fresh and accessible. In that sense, it really reminds me of the Small Batch from a few years ago. I would not have minded a little bit more body. On the palate too, it is very fruity and sweet, while the peat is a lot more outspoken. It even flirts with tropical notes, which I quite like. Loads of vanilla too. Yes, again, I am reminded of the Small Batch. The finish is not very long, but with a lovely smokiness and a touch of mint. Vanilla and citrus remains present throughout. The sweet ash is nothing special but nice. Only makes a nice finish still no good whisky and really nice is not even the departure. For me it has more than a few flaws. At the border to the sink. Slanted, vulcanized rubber tire, clutch wear, disinfectant, from behind tried on cramp a fruit sneak up. Warms violets, without end. Nothing at first, watery consistency, after a while quite bitter tannins, artificial sweetness and an indefinable guminess with a good pinch of anise. Foul wood on the finish, which slowly gives way to slightly sweet ash, which gently lays on the tongue. Thankfully, that's relatively short.